I’m often here on this stage on Sunday mornings, but I’m used to being up here with a violin in my hands playing for weekly church services. I never imagined these would be the circumstances under which I’d be speaking in this space, this is really one of the hardest things I’ve ever had to do. But when Joey’s siblings asked me to say a few words about their beloved brother—who was my treasured friend, revered teacher and upstairs neighbor—how could I possibly refuse? How does one find adequate words to sum up such an extraordinary person as Joey Corpus? How do you possibly begin to describe this beautiful inspiring man who was so brilliant and wise, so talented, so complex and multi-faceted, so funny, kind-hearted and generous, who lived his life with incredible grace in spite of having to overcome such huge obstacles? Anything I say today will be merely the tip of the iceberg. As I look around at all the people here to honor and celebrate our dear friend, I know everyone in this room has their own particular experience of Joey. I wish I could hear every single one of your stories. Since I’ve been given these few moments to speak, I’d like to offer up my own Joey-appreciation. I first met Joey in early 1997, a time when I’d been sidelined by a debilitating left hand injury that occurred in my last year of school. Long story short, Joey put me back together again…and then some. Not only did he rehabilitate my injured hand, he helped heal my musical heart & soul. Joey helped me discover a new joy and freedom while playing the violin, something I once could have only dreamed was possible. He was a brilliant analyst, not only in dissecting what needed to happen on a purely technical violinistic level, but he was also just as much an insightful therapist as he was a violin teacher. He had this uncanny way of putting you at ease and making you feel instantly comfortable, disarming you with his kindness and warmth, his sense of humor and that irrepressible twinkle in his eye. He made you feel in your heart-of-hearts that everything was going to be okay, and in fact, much more than just okay. It was like he was your guardian angel. He was the ultimate confidence-builder, helping you work intelligently and efficiently so that you would be at your best the moment you walked out on stage to perform. Getting his seal of approval and knowing he believed in you made you feel like you could do anything. What an incredible gift that was, and I know so many of you had the privilege of experiencing that with him too. In the late 1990s, there was a small handful of us who’d regularly trek out to New Jersey for lessons. It was always a 6-hour event, involving multiple subways and commuter rails, and lessons were always 2-1/2 hours as dictated by the train schedule. We were thrilled when Joey first talked about moving into the city, and right away I’d inquired in my building if any apartments were available, but alas there was nothing. A few weeks later, I woke up one day full of energy and determination, convinced I’d find him a place that day. I spent an afternoon scouring the Upper West Side, pounding the pavement and inquiring at every doorman building that looked potentially wheelchair-accessible, but no such luck. I came home, discouraged, but as I walked into the lobby and chatted with my doorman, I suddenly said, “Please tell me there’s something opening up in this building soon.” As a matter of fact, one of the tenants had just given their notice an hour before, and I immediately snapped up an application for him. We got it filled out and submitted within a few hours, and three weeks later, Joey moved into the Whitehall Apartments. Anyone who’s ever tried to obtain an apartment in NYC can appreciate how miraculous this was to have happened so quickly and seamlessly. I used to joke that I found Joey an apartment in my building out of purely selfish motivation. Whereas a lesson with him used to require three different modes of transportation and was an all-day affair, now I could simply walk one flight of stairs and didn’t even have to put my shoes on to get to my lesson! The long commutes to Jersey for lessons were absolutely worth it, but I loved having him one floor away. Joey seemed liberated in NYC, able to get around the city easily in a way that hadn’t been possible in the suburbs, and it was wonderful to see him so happy. Once he was in the city, word of mouth began to spread and students began flocking to him. Our group of friends had frequent dinners with him and classic movie nights together at his apartment, especially during his first few years in the city before he became so busy teaching all the string players in NYC. I treasure those times with him. Joey started his Manhattan life in a small studio but eventually moved to the apartment directly above mine. He would always call me moments after I started practicing, and I would always pick up the phone and say, “Oh good grief, is it THAT bad already? !” It was a long-standing joke between us, but he’d call when he heard me because he knew I was home. Even when we went through periods where we didn’t see each other frequently, there was always this unspoken comfort of being able to hear each other from one floor away. For the past fifteen years, part of the aural fabric of living in my apartment has been the distant roar of taxis and buses down below on Broadway, and always the faint sounds of violin-playing or other music from Joey’s apartment directly above me. I miss that already. I knew he’d been sick in November, as he’d cancelled lessons I’d scheduled with him, but I certainly didn’t realize the serious extent of his illness. In typical Joey-fashion, he hadn’t wanted any of us to know he was struggling. I’d heard occasional sounds upstairs later in November, and I assumed it was Joey up and about, noodling around on the piano as he often did. I couldn’t have fathomed he was in the hospital all that time, that any sounds I’d heard upstairs were his siblings occasionally checking in on his apartment. At the beginning of December, I dreamed about him right before waking up one morning. In the dream, I was waiting for the elevator in the lobby, when the doors opened and Joey went zooming past me. I tried to stop him and hug him, but he said with a big smile on his face, “I’m sorry, Louise, I have to keep going right now. I’ll catch up with you later.” That morning I awoke to a message from his brother, informing me that not only was Joey still in the hospital, his condition was life-threatening and he wasn’t expected to live much longer. Joey moved into our apartment building on December 9, 1999 – and on December 9, 2017, he moved again, permanently out of our building. But I believe he went somewhere far greater. I know we are all suffering terribly right now. But whatever you believe—or don’t believe—whatever your take on spiritual reality is, I hope you will somehow take heart and be comforted by the fact that Joey himself believed in a glorious future. He was a man of great faith, and he placed his faith in an eternal future full of immeasurable hope, of matchless grace, of unbridled joy, where all the present-day brokenness will eventually be truly healed, where all the pain and suffering here on this earth will be transformed and redeemed, giving way to everlasting rejoicing. I like to imagine Joey on the afternoon of December 9th, striding through the gates of heaven into eternal glory, walking easily on perfect legs, being greeted with open arms by God Almighty Himself saying to him, “Well done.” Those of us he left behind are heartbroken and devastated by the loss of him, but I keep imaging him running and dancing, and that is enough to fill my heart with unspeakable joy despite all my tears. I know the angels are rejoicing to have him in their midst, that the music in heaven has become that much sweeter for having Joey there. And I bet all the string players in heaven will still want to go play for him. Joey, I will catch up with you later. Until then, thank you for changing all of our lives. I speak on behalf of your many devoted students and all your loved ones in saying thank you for the profound healing you brought into our hearts, minds and souls, musically and otherwise. We will try to honor you with our music-making, showing love and kindness and compassion towards others, in the same way you showed us. We are so lucky to have had you in our lives. We love you forever. Good afternoon, My name is Jorge Ávila and I am a violinist from Honduras. For those of you who don’t me, I was a student of Joey, as well as a friend. At times I felt like I was his brother from another country, finally reunited and each catching up about family members we didn’t know existed. I would like to thank the Corpus family for giving me the chance to speak and say a few words about Joey and what he meant to me, and to many many others of us – some in this room now, and some absent, but all of us whose lives he greatly touched, changed and improved. Joey and I had a lot in common. We both have the first name of Jorge, we were both born in tropical countries, and we both started playing the violin in our teens. I had my first private lesson at around 14 years of age; I think he started about then, as well. I’d like to think that we both had a positive outlook at life! However, this isn’t always easy to maintain when it comes to playing the violin. I met Joey in Feb of 1998, and had my 1st lesson with him a month later in March 1998. I met him thanks to my dear friend Louise Owen who introduced me and said to me “you need to come play for him.” At the time I felt like a broken toy that needed gluing, mending, fixing in some urgent way. There were so many holes in my education, and I knew it . So I went to Garfield, New Jersey. It was a real trek to get out there! And by the time I got there that first day, I realized I hadn’t planned my next feeding properly and I was very hungry! But I remember Joey very generously saying to me “let me see what I got in my fridge in terms of leftovers.” The first food item I received from him was the most delicious chicken type soup, stew culinary delight. It was the best food I remember eating w him; and we ate together lots of times. I learned then that he was not only a great teacher, but a fantastic cook. The 1st thing I played for Joey was the Mendelssohn violin concerto. I was so nervous, and once I was done with the first page, he stopped me and promptly said “great job Jorge. Now, let’s do it again.” Immediately, I could somehow breathe again and relax a bit. He started working on it with such kindness, humor, and disarming simplicity, that it became clear to me in the first 10 minutes or so, of what turned out to be a 4 hour lesson… that my life HAD changed forever! Joey gave me multiple lessons throughout the next 19 years of knowing him, and his generosity of spirit extended far beyond the run time of each lesson. He let me haverun-throughs at his apartment, came to my recitals, gave me music, photocopied music for me, downloaded music, copied or burned CD recordings on his computer, and altogether facilitated my learning in more ways than any teacher ever had in my life! Food played a big part in our friendship. Joey and I ate after many lessons, and sometimes even before; white rice and black beans; either green plantains or ripe plantains. There usually was also an avocado salad, mangoes, any tropical fruits…and of course a good flan as dessert! We both liked eating the crispy crunchy skin of either pork or chicken, named chicharrón. I usually would order these foods and bring them with me to the lessons. We discovered early on that it was BEST to work first on an empty stomach and then eat than the reversed order. Throughout his years of working with me, Joey encouraged me to be the best Person I could be, inciting in me discipline I never knew, and the joy of working hard and getting better as a result. He taught me that there are no limits if you’re using the right techniques, the right approach, the right attitude, and the right frame of mind. He reminded me that thankfully I have been given some gifts that are not easy to replace – like fearlessness – and rekindled in me the joy of playing in front of people. Joey tailored his comments and his help according to what each student needed. He was always interested into diving into what made you you. Not only was my relationship to the violin most definitely improved by Joey’s help, but he also gave me the most valuable help mentally and spiritually that no therapist, friend or colleague could. He understood me! He made me able to believe in myself and try to be the best Jorge I could possibly be! This included playing the violin, of course, but it also included being better, kinder, wiser, calmer, more collected, and more generous towards others persons. One of the most important transitions in Joey’s life was the move to Manhattan. His apartment in Garfield had a couple of steps which made it impossible for him to leave on his own! We were all so happy to have him here in the city. Even though we never discussed it, I knew he felt like a bird in a cage; when he came to New York City, that bird grew wings and he could fly! When he got here, he took the bus everywhere, he rolled himself down Broadway as far as his arms would let him, in all types of weather, rain snow, the cold was never an obstacle. Once in town, he helped so many of us find our voices as violinists. Personally, he helped me find courage to enter international Violin competitions in my late 20s(which is kind of late). But thanks to him, here I was at 28-32 year-old entering international competitions because Joey had armed me with wisdom and the understanding that it didn’t matter that I was older, it just mattered that I was there. No matter how much of a struggle a piece was to play, Joey always kept things positive. Even though he jokingly said to me once “Jorge, we are a perfect pair, you love suffering, and I love inflicting pain.” Clearly he was kidding… But he taught me that some things that are super difficult, and not as fun to do, payoff in the end. As to his own physical hardships, I never heard him complain. Joey leaves behind not only a wonderful family who loves him very much, but also an acquired family which he collected for the many years he was on this earth. So today we mourn the loss of a friend, a colleague, and family member, a great teacher – one of the best ones that has ever been – a kind soul, and dear friend. May you rest in peace Joey. May the place where you rest now be free of wheelchairs, and of any other physical limitations. In that great place where you are now, may your new legs, your new body, carry you speedily to a banquet table in which you choose to sit next to the most distinguished pedagogues, philosophers, and healers of all time. We will miss you Joey. May you run and fly with all the freedom and speed you can muster; and may we meet again in that fabulous place and enjoy some more pork, rice and beans and plantains in our new and improved bodies. 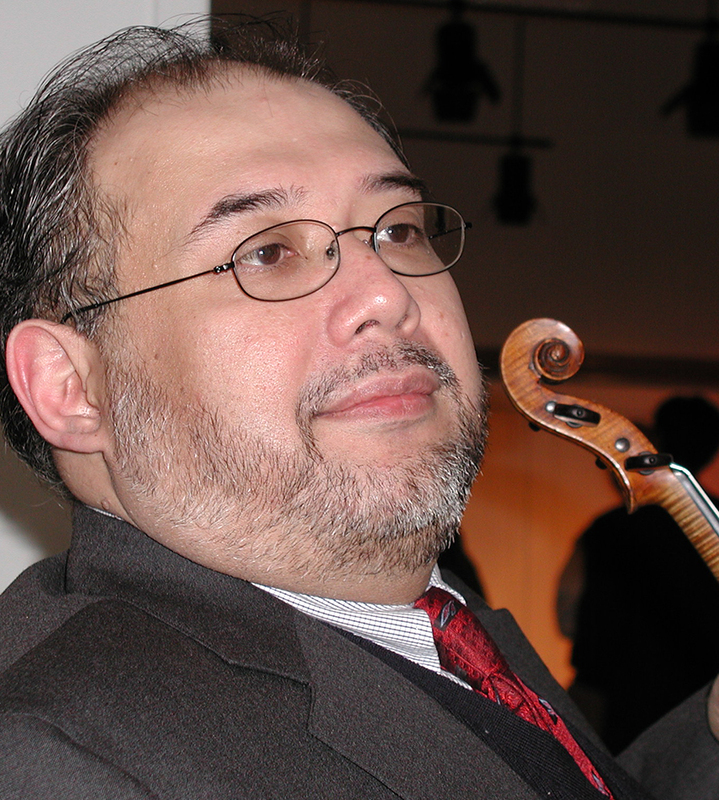 Much has been said of Joey Corpus, the violinist, the teacher, the “underground guru”. Please allow me to talk about Joey – the grandson, the cherished son, the beloved brother, the generous, loving uncle and a truly loved nephew and cousin. I first saw him as an 8-yr old, at a family dinner, with his younger brother, Roberto and their first cousin, Enrico. Joe and Enrico were focused on the prospect of devouring the 2 roasted chickens on the dining table. Bert was quiet, disinterested in the meal, and looked bored. I love to picture that moment, and how that dynamic persisted through adulthood — Joe and Enrico’s love of food is still legendary within the family. But I marvel at how those 3 would mature into handsome, accomplished men — who would still sit with me, their Tita, and tell stories and jokes. Anyway, the weekly Sunday Family dinners at the Aguilar home were a tradition. It was a big, very happy family until the tragic car accident that caused the death of Joey’ s mother and Joe’s paralysis. Through all those difficult years, Joe had music in his heart and mind. To be a violinist was his goal, his dream. It is no surprise, and may even have been expected, that the Corpus and Aguilar families would have children and grandchildren who would be brilliant in the world of music and art. They did not disappoint. In Philadelphia, New Jersey and New York, together with his brothers, Bert, Hector and Rolando, they encountered obstacles, bu t worked very hard, and thrived . Here in the States, too, family was always around, especially his cousins who shared the same joy of music . I can imagine the fun they had playing together, and I know that one of the photos that Joe treasured, was of the young cousins making music. Joe’s interests and expertise were wide and varied. Although his mobility was restricted, he lived in his own BIG world– through books, and every accessible technology. He lovingly indulged all of our requests to perform his amazing magic tricks– which were the highlight of every family gathering. And he delighted us with his other special gift : did you know that he was an excellent mimic? those nimble fingers, facial expressions and voice, he could create a hilarious, but always good-natured sketch of whoever we asked him to imitate. And if one loves delicious, yummy food, talk to Joe. The 8 year-old gourmand from our family dinners, became an accomplished cook himself, with recipes and techniques that I found incredibly helpful. During these last difficult weeks, it was uplifting to meet Joe’s friends from his church community. With Joe’s wisdom and compassion, he would have been a good pastor. Marie imagines Joe, now, running. I imagine him chasing angels. He loved beauty and he loved ladies. He loved his family, and his friends. I witnessed that same love in his siblings in Philadelphia, Spain and the Philippines who, weeks ago, dropped everything and rushed to his bedside. hospital. And I know that his cousins from near and far, lovingly rooted for him, and prayed for him, to get better. and will help us smile and laugh and be ever grateful for the beautiful and special gift to us – Joey Corpus. Thank you for listening and thank you for being here to celebrate our wonderful, beloved Joe. When I first started to think about what to say, it was really difficult. Am I the right person to be up here, what would I talk about, would I say right things? So I did what every loving brother would do. What to say at a brothers eulogy. It turns out I can say a lot of things: about what he meant to me, the things we did together, his favorite things, his accomplishments. But Joey’s entire life is too unique to pull out of Google. And yet, in all the years I’ve known him, he never questioned why his life was different. Not once did he ever complain about the struggles of daily life, or complain that he couldn’t do this or that, or that life for him was harder than most. Not once did he ever show self-pity. He took what was given, accepted it, and made the best of it. He was 10 years old when the accident happened. And shortly thereafter, he was around 13, maybe 14, when he showed interest in our grandfather’s violin. 14 years old. I know what all the musicians here are thinking. Joey, you were 14 years too late. But that didn’t phase him. He didn’t think about starting late, his handicap, whether or not he could do it. He just did it. Unphased and determined. I remember one summer in the philippines, during one of his many trips to the hospital, i challenged him to a game of chess. I never came close to beating him. So he must have been shocked when I challenged him to a game. I told him he’d have to play without looking the board. I started with E4, then he played E5. Then 2 moves, 4 moves, 6 moves. That’s when it got interesting, because the moves became unpredictable. I remember thinking no way he can go much farther. 8 moves, then 10. These were 10 moves each, and he still could see the board in his head. Then 11 moves, 13. It was not until we had 14 moves each that the board in his mind got a little blurry. He asked me where my knight was, and then he slowly lost track. That’s 27 chess moves made in his head. No matter what disadvantage or obstacle, he fought. If he couldn’t see the chess board, he used his mind. If he couldn’t use his legs, he used his arms. He achieved more in his 50 years on a wheelchair than many of us, certainly more than I ever will. At 15 he won a violin competition. 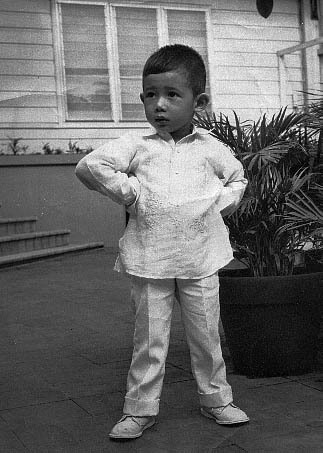 Edgar Schenkman, then conductor of the Julliard School, was in the Philippines and saw Joey’s performance and offered him a scholarship to attend Julliard. But Joey was still rehabbing and was unable to make the long flight. Then in 1982 another full scholarship funded by the Philippine government to study with Jascha Brodsky in Philadelphia. This time he was able to travel. In August, 1982, Joey and I travelled together to Philadelphia like 2 puppies. I was 18 he was 25. We had no idea what we were doing and what we were getting ourselves into. For the first time in both our lives we were on our own: new country, new system. We watched cooking shows together and learned to cook. We were so out of our element but we chugged along. Then in 1986 there was a revolution in the Philippines and all financial aid completely stopped. We were faced with the choice to stay or return home, where we wouldn’t have to worry about rent, bills, and chores. But it’s not like we had a history of common sense. So we stayed. Prior to coming to this country, back in the 70s Joey and I watched a lot of tennis. This was during the Borg / McEnroe rivalry. I decided I wanted to play tennis. I found my father’s dusty old wooden racket. The head was slightly warped and the grip was oversized, but the gut strings were still somehow intact. I began hitting the ball against the wall and I thought I got pretty good. Joey said I should sign up for this big upcoming tournament. Keep in mind, I had only played against this one wall my entire tennis career, so I did the logical thing, and registered. Then he said he’d tag along and be my coach. I thought, sure, of course I need a coach. My opponent was Charles Arquiza, I’ll never forget that name. Charles Arquiza. Sometimes Joey or I brought up his name and we’d giggle like a couple of amused school kids. Before I went to my side of the court, Joey gave me one last piece of advice: “don’t forget to bend your knees.” I wasn’t sure what that meant but I said ok. He wheeled himself to the sideline. No sooner did I get to my side of the court when the match was over. I don’t think I even scored a single point. It turns out, playing a real opponent is nothing like playing against the wall. We slowly headed back to the car, defeated. Me with my antique over-sized warped racket and Joey ungainly wheeling himself along the gravel walkway. I could not figure out what went wrong. In many ways deciding to stay in philadelphia without a plan or a clue was like that tennis match. Besides not having any money, no job and no prospects, we had absolutely no idea what we were up against or what to expect. But unlike that tennis match, Joey came out of it standing tall, victorious against all odds. He began teaching, many times for free. He then moved to New Jersey and then to the Upper West Side. New York adopted him and he thrived. This was his home. For the rest of our family his apartment became our second home. This is where we gathered together to be a family. And here we are today, where Joey has brought us together. A dear friend of mine just said that loss leads to more love if you let it. This is exactly how I’ve been feeling these past few weeks connecting and reconnecting with so many of Joey’s friends. But alas there is no Joey, no high-pitched giggle, no dancing eyebrows and no magic tricks. What we do have are stories, reminiscences, and anecdotes that will hopefully live forever. Not even Google can come up with these results. Wherever you are, my dear brother, may you walk with God, run with the wind in your hair, and dance the Bossa Nova with the angels. You have always been and will forever be a part of me. I love you very much and will miss you always. Where ever you are I know that you will receive this—my gratitude, my admiration and my love for you. I always tell people about the first lesson I had with you. I had taken ‘too much’ repertoire and thought I’d never get through it all with you. About 10 minutes before the end of the lesson you had isolated problems in each piece and study and given me exercises to solve them! You asked if there was anything else I was working on! The ease and expertise that you have to isolate and solve problems are the best that I have had the pleasure of receiving. You changed the way I play and you have molded the way I teach. Every time I place my violin under my chin, a huge part of you is there with me, in my hands and in my head. I am forever grateful for all that you have taught me. I am grateful for the warm and passion that you showed me in my lessons. I looked forward to our lessons immensely and came away with an incredible feeling of joy, love and determination. I smile so much when I think of your smile and your sense of humour. You had the perfect balance of warmth, patience and expectations for me. You always made me feel comfortable to play to you even when you pushed me further. Sending you peace for your journey. “Congrats Guy! What do we need to work on?” would normally be the response. Joey was Emile Flourney and I was Guy Gadbois – two of the pseudonyms Inspector Clouseu adopts in the much loved Pink Panther movies. Joey and I had nicknames for lots of our friends all of which I will keep to myself! Mostly they would be initialised. He had a language with everyone. It was part of that personal connection. During these past terrible weeks, I have been reading and rereading the thousands of messages Joey and I sent to each other, sometimes up to twenty times a day. It was as though we had one long conversation from the very first phone call in which Katharine Gowers introduced us. The call was in September 1999 after Kathy had spent a month with Joey and on returning home, she remarked I should cease having lessons with her and get myself out to the US. Joey and I must have spoken several dozen times prior to our initial meeting – the conversation flowed and it felt so natural every time we did. Joey emanated an innate sense of calm and at the same time I felt an excitement at the prospect of meeting him in person. I remember that first lesson distinctly. Late January 2000. Being an avid note-taker, I looked back on my writing and the first entry, in that first notebook was the recipe for Adobo followed by vibrato exercises and ending with what Joey called the Violinist’s Secret. This Secret was teaching me to do a couple of card tricks. So, we ate, practised and had fun. I also received some rather piquant love advice: “Perhaps you don’t like the food anymore, but, when the bell rings, like Pavlov’s dog, I start salivating.” I didn’t press at that early stage in the relationship. I spent the later part of the afternoon and late into the evening with him and our friendship was sealed. Joey was always incredibly generous with his time and my lessons would last for hours. I say lessons, and lessons they were. No matter what we did. Joey changed my life completely. Actually, that does him a disservice. In his own subtle way, he permeated my life with such a beneficial and benevolent positivity, with grace and good humour – both in the funny and the joie de vivre senses as he did for all with whom he came into contact. Talking about the violin, violinists, love of family, music, chess (through my brother I had a couple of friends who were grandmasters and I introduced them to Joey), magic, watching movies, listening to the Curtis Quartet and other music (Joey lit up my life with Bossa Nova and Jazz), deciding what to order for lunch/dinner, life, love and girls. And girls. And girls. He was often frustrated with my choices of girlfriends (hence my changing them so much!) and jokingly used to comment that if I let him run my life completely, I’d make good choices and be blissfully happy. He was probably right. Swami. Another name. Maestro. Yet another. Tuesday nights quickly became regular time together after my move to New York on 9th September, 2001. Even though Joey had to have Tuesdays and Fridays resting in the early days in NYC, I would come and pick him up at 7.30pm in order to get to Smoke, a jazz club on the west side of 106th and Broadway for 8.00. Tuesday nights were B3 Hammond night with Mike Ledonne, Peter Bernstein on guitar, Eric Alexander on sax and Kenny Washington (or “K. Wash” as Joey inevitably named him, and always pronounced with the perfect ebonic accent), on drums. Joey was in his element. Sitting at the back of this small, atmospheric club, his head would go back and sway from side to side to the rhythm, with eyes closed. Over the years, Joey and I took several friends to Smoke but nobody loved being there as much as he. Joey was often greeted by the musicians after their first set, from which he got huge pleasure and on his last visit, in early October, even having not been for a long while, Mike Ledonne shook his hand and chatted with him. This prompted an immediate message that came my way which was not at all boastful, just perfectly genuinely excited and thrilled; perfectly genuinely Joey. Concert going was another activity we enjoyed together. For my birthday, Joey would buy season tickets for him and me to attend all the Philadelphia Orchestra concerts at Carnegie. Another example of his generosity and thoughtfulness. They were always fantastic and I remember one performance in particular. It was Mahler’s monumental Third Symphony and it was one of those concerts of such perfection that neither of us could speak a word to each other afterwards – not though dinner nor on the way home. It rendered us both speechless. I’d like to share some of the messages Joey sent which show his multifaceted interests, keen observations, sensitivity, humour and his brilliant mind. Joey in his own words. Maybe we just have to accept the fact that Drdla, Ries, Aulin, Raff and all these composers were superior to Beethoven, Brahms, Mendelssohn. Hahaha. I told you so. It’s puzzling that melodies that are not up to the greatness of the masters draw out the most beautiful playing from the players. One thing I’m realizing, for kids to spend time with the great masters will not necessarily make them better. So, instead of giving them Mozart 3 (which i hate anyway) or Haydn 1st or 3rd concertos, I’ll give them the little short pieces. My list: 3 pieces by Kreisler. Andantino, in the Style of Martini, Berceuse Romantique, Toy Soldier’s March. I don’t think it’s possible to play the violin more beautifully. (I was going to include the Grieg sonata w Rach on my list.) The Toy Soldier’s is “simple” playing that is not humanly possible. Ok, the second is David Nadien playing 3 pieces. Drdla Souvenir, Mendelssohn on Wings of Song (best double stop playing I’ve ever heard in a recording), and Raff Cavatina. I could have chosen 3 Milstein short pieces or Heifetz. It doesn’t really matter. so, what’s the point of this seemingly useless exercise? But u can’t isolate the school from the general musical trend that swept the world after WWll. I think it’s sometimes referred to as the objective school or approach. “Don’t do anything that’s not written in by the composer” was their motto. (It was really the death of music performance. I don’t think the world has ever recovered from it.) Violin playing can’t be separated from abstract musical ideas. If you adhere to the above motto, how do you think that will affect your ideas about phrasing, tone, vib, even fingerings and bowings, etc? How was teaching yesterday? Teaching, a noble profession according to some. I’m sure you’re happy to give of yourself fully to the skulls full of mush who have been entrusted to ur care. I, Roberto, am not. One of my favorite writers just tweeted this: “Hell is where the police are German, the lovers Swiss, the mechanics French, the chefs British, and it is all organized by the Italians.” Ain’t stereotyping grand. He brought music by the man who took off his wig on a windy day, Fresco-baldy. Not the music discovered by Michael J Fox – Bach to the Future? Haha! Very funny. You’ve really got a Handel on Baroque punning. First composer who had a saying named after him. Out of da frying pan into Da Falla. I forgot to tell you about my uncle who was on holiday in Egypt. His neck and back were aching so he went to see a Cairopracter. It’s impossible to imagine the world without Joey so I intend not to. The legacy of his extraordinarily searching mind will be passed on to my pupils. I have, and will continue, to honour him in every lesson I give. I will try to listen to music with his ears. I will attempt to bring his humanity, humour and bravery to each and every difficulty in my life to come, for he was the most courageous person I have had the privilege to meet. Although that next session won’t be forthcoming, and many years of study with simply the epitome of teaching is lost, I will read through my six full notebooks until I find the spark of an idea. I still believe it to be the case but am now acutely aware that this was applied to so much more than just violin teaching. I cannot help but feel so very lucky to have been privy to some of Joey’s thoughts, violinistic experiments and musings on many aspects of his rich life and fertile mind. And to that wicked sense of humour…his raucous laughter will always ring fondly in my ears, bring a sparkle to my eye and a smile to my lips. York for their unerring support and love. Herbie: I am a current student of Joey Corpus, and am so shocked and devastated to hear of his passing. I am a current student of Joey Corpus, and am so shocked and devastated to hear of his passing. Just two weeks ago, I was emailing him to ask if we could change our lesson schedule in the future to make way for my mentoring program. I had thought he was recuperating, and would be ready to teach again in about three weeks or so. It was such a surprise to me when I found out from my former piano teacher that he passed away. Now I am left with no physical teacher, but I am very lucky Mr. Corpus has stashed a vault of violin knowledge into my brain. You will always have a special place in my heart, my hypothalamus, and my muscle memory, Mr. Corpus. When I sent him the request for my first lesson, it was from my email called “noodlehead boi”, so naturally he always called me Noodles in each and every lesson. Ever since, our hours together have been hours of so much fun learning violin. He is the one person who could teach me to keep my bow straight, and the way he did was the most unique: he had me rub my hand on my violin case in the shape of an L. It was the best lesson ever, and my consistent straight bow stroke has positively impacted my sound to the total next level. in a horror movie. From now on, I always remember to make sure that I hold my violin up, and my sound is much better than when I played with my old, Frankenstein-like posture. There are a small amount of crazy happenings in a few lessons. Throughout the months of April and June, he gave me cough drops each lesson to compensate for my tendency to sneeze in the spring. One lesson, he made a mistake in giving me the super-hard mint cherry flavored ones (with about a million grams of sugar), and my hyperactivity went beyond its normal level. Although the lesson was a great one where I took the train back home with my head full of violin knowledge, it was also a crazy one where I almost accidentally ordered 400 packs of Cheez Doodles on his Amazon Echo. I remember the day before my 14th birthday, I told Mr. Corpus “This is the last time I’ll be seeing you…. (what? Noodles, why didn’t you tell me? )… ​when I’m 13 years old. (Oh, is it your birthday?). ​That was one of the best jokes I ever told him. valuable life lessons. For example, I remember the one lesson I forgot my sheet music for the piece I knew by memory. I honestly thought I could just pass it off, but at each memory slip-up, he would tell me “that’s why you need to bring your music, herbiewerbie” in a singsong voice. Now I never forget my music or any materials to anything. My last lesson with him was one where I was preparing for my orchestra seating auditions; Mr. Corpus found out that nobody had fingered our parts for Shostakovich 5, and started humorously grumbling about how the orchestra needs to cater to the needs of each student, saying “This is very hard music… why do they not finger it?”. Now I am third chair for first violins at the ISO Symphony. That last lesson was also when I found out he loved jazz, and that he liked to improvise on his piano. If I had one more lesson with him, we probably would’ve had a 5-minute long jam session together before seeing me off with a “walang ano man, say hi to mom”. I was devastated to find out that he passed away and I am very sad that it was so sudden. I am very grateful for the one year and five months that Mr. Corpus has taught me not just violin, but how to make better jokes, being mindful enough to remember my music and that anchovies taste good on anything. I know that he is in heaven now, and that he is free from disability. I’ll tell you one thing: if God is the king of heaven, Mr. Corpus is his court jester. I will never forget him and I will miss him so much. I will carry on his wisdom and teachings all throughout my life.